Tropicarium- Oceanarium is a complete delight for anybody who likes to see animals living in a comfortable habitat. 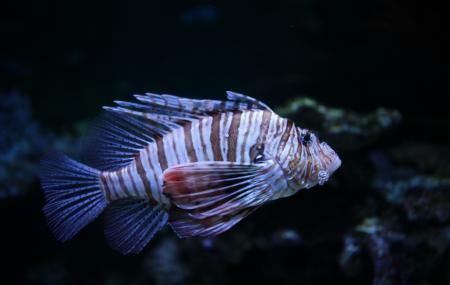 The best part about this tropicarium is that is the largest saltwater aquarium in Central Europe and is situated a little away from the hustle bustle of the city on the outskirts. The biggest highlight of this place is the deep shark tank, where you can see sharks go about just like they would in the ocean. There are about 8 sharks in this and you can see them through the glass walls. The natural habitat is recreated for the animals over a widespread area of 32,000 square feet. The habitat is recreated in the form of a tropical rainforest where you can see creatures go on about their day and you get a chance to interact with them in your own way. For experienced divers, swimming with the sharks would be a memorable experience. For others, seeing various species of monkeys, fish, exotic birds is an awesome reason to visit this attraction. Video films or photos can only be taken in the exhibition area for own use but no flash allowed. Air balloons, shopping carts, child cabs cannot be taken in the exhibition areas. Birds keep on flying freely in several rooms. Hence be careful while visiting the zoo. Take care of cleanliness and leave any litter in the appointed cans. Dogs are not allowed to bring into the zoo, except Registered Assistant Dogs. Check the animal feeding session from the official website. People normally club together Tsz Bekötő út and Hungarian Natural History Museum while planning their visit to Tropicarium. Nice place to visit, with big variety of fish species, nice aquariums, forest-like environment with birds and a lot other interesting species. I recommend this place for families with young kids, for people who admire marine life and love fish. I really liked it here even though I expected it would be a tad bigger. Tropicarium is far from city center so if u don't have have a car prepare yourself for an hour long journey by public transport. Aquarium would be better if every info on animals was also in English. Other than that shark aquarium is really great. My entire family loved it!!! We got some discounted price using our Hungary card that was very pleasant. The place is kept clean and spacious for visitors. Easy way through with the stroller. Very nice animals! Thumbs up! Highly recommended. Amazing animals, amazing sight. You feel like you are in the jungle rather than in the tropicarium. The aquariums are mind-blowing, especially the one that has a tunnel in it. It's a good place to bring your young kids. They will really enjoy the last pool, where you can touch the fish. Amazing exparience.